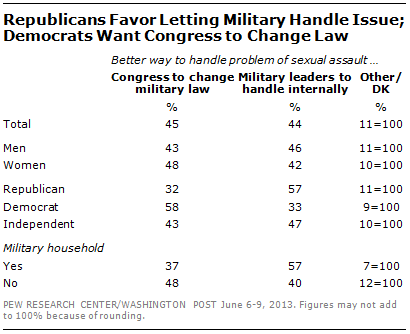 Though an effort led by New York Sen. Kirsten Gillibrand to establish a new system for prosecuting military sexual-assault cases has gained some key conservative support, Americans are split on how best to address the problem. Republicans and independents also were more likely to see reports of sexual assaults involving military personnel as individual acts of misconduct, while Democrats were slightly more likely to see them as reflecting deeper problems within military culture itself. Interestingly, women were not strongly in favor of one approach or another; less than half (48%) favor Congress taking action while 42% prefer the status quo. And while 81% called sexual assault in the military a “very” or “extremely” important problem, only 11% said sexual assault was a bigger problem inside the military than outside it; 63% said it was about the same inside and outside. Gillibrand’s plan would remove the authority of military commanders to decide whether or not to prosecute sexual-assault allegations within the ranks. The proposal was rejected by the Senate Armed Services Committee in June, but Gillibrand is trying to gather at least 51 co-sponsors to force a debate on it in the full Senate.